I bought a very neat tool a few days ago and as soon as I saw it I hit the buy button. It’s something that I have had in my mind to build myself since I started teaching stuff about the mini-scraping strategy, but just never got around to it. If you’re not familiar with my miniscraping strategy don’t worry, by the end of this tutorial it will be clear and I hope that you will be as excited as I am about how this whole system fits together. 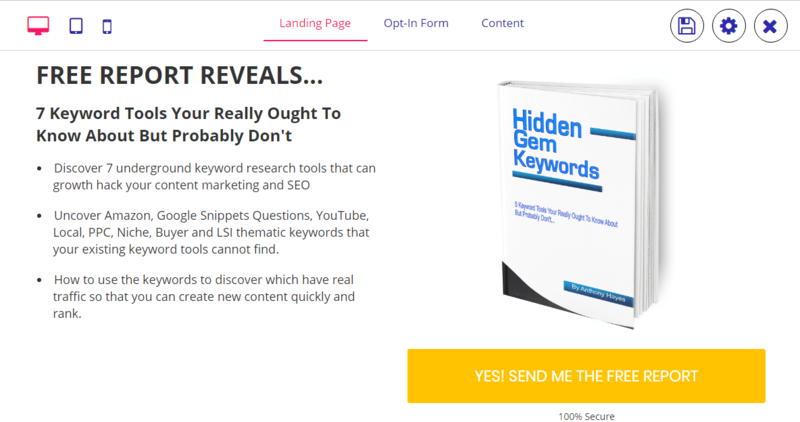 So the tool I bought is called LeadKit and it’s a simple funnel building tool that you can add a squeeze page, two step optin and deliver content all in one place. 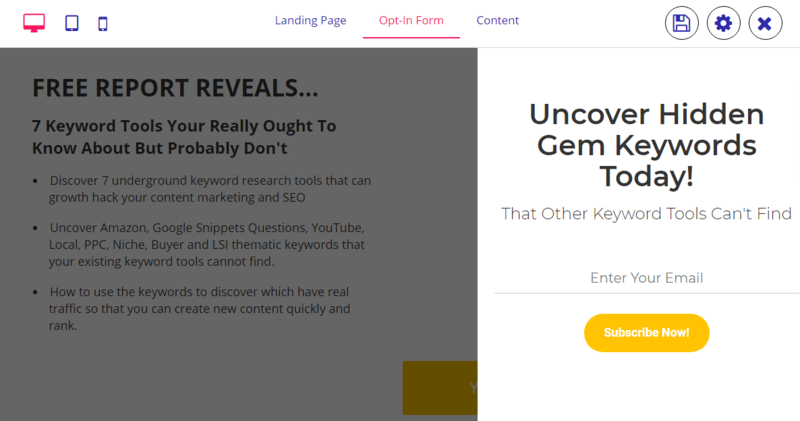 Sure you can do this too with other tools like convertri or clickfunnels but I like the simplicity of this system and I love that it gives you the option to break down your content into multiple pieces to be delivered in parts. Here is a screenshot of one I have been working on today to give you a clear picture of the app and what we are doing and this will give you an insight on ONE of the strategies to use it. This strategy can be used in any niche and monetized but the real game here is list building and using my targeted traffic strategy this could be highly effective. Knowing what I will be working on next and what other lead magnets and strategy ideas I have makes it simple to implement long term. Quite simply is List Building with highly targeted traffic. Not just any traffic though, this traffic is coming from facebook groups that are very niche or sub niche specific. The way I am doing this is specifically designed with lead nurturing and building the know, like and trust factor in and making this new audience familiar with my content and strategies. OK so lets cover what we will be doing in bullet points and then I can create more information and videos for each of the steps. This is in very simple terms, we will get into the details and adding more complex strategies to it and expanding on each of the steps below as we progress with this tutorial. The lead magnet will ideally have some monetization built in with affiliate links being the simplest way to do it. I will deliver the content by drip feed daily and send notification by email, but I will be sending them to LeadKit Pro to get the content. At the end of the content I will add in an evergreen call to action or offer that allows me to move forward and create more lead magnets. Then we will switch on the TRAFFIC! We will monitor the stats on all links within the lead magnets in order to determine how well they are doing and if they are monetizing so that we can always change out parts and split test. 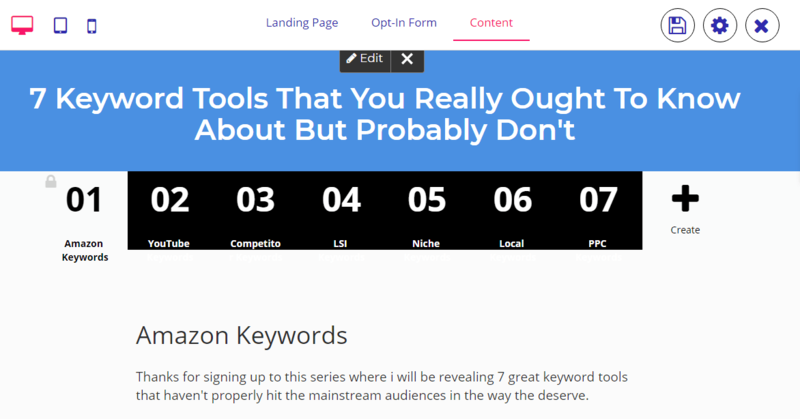 In the screenshots above you will see one strategy that I have used and that’s a list of keyword research tools that most of my targeted audience will never have seen or heard of. This is a deliberate approach and I have used my affiliate link in each one and simply curated the content from their sales pages and swiped a demo or two from YouTube. Create a multi part series on a specific topic with each lead magnet in the series being part 1, part 2 etc. Now here’s why I was really excited about this tool, the second I seen it I knew it was time. As this content is locked in a member area (and we are curating the content for the most part) we do not have to worry about duplicate content. We do not have to think about Google, penalties, spinning content or even things like adding an alt tag with keywords to the images. This makes the curation super fast and you can knock these out in about 45 minutes each. I also invested in some high quality lead magnets too and have around 180 of those all in the internet marketing niche. You won't find these in PLR sites and they have great copy to use with them too. It’s a simple copy and paste job that I can teach an assistant to do (even at a set fee per lead magnet) and know these out in bulk. We are going a little black hat here as I will be scraping facebook groups around specific niches. The groups will have at least 10,000 members in each and we will grab ALL of their REAL email addresses and creating a custom audience with them inside facebook ad accounts. I scraped almost half a million emails from SEO specific facebook groups and added them into facebook ad accounts. After facebook had rendered them I was left with 130,000 audience. I guess that some people are in multiple groups, im not sure but im am not unhappy at all with 130,000 highly targeted audience to use whenever I want to switch the traffic on to an SEO related offer. I created multiple geographical lookalike audiences with the 130,000 and that produced a total of 17 million within the lookalike audiences broken down by regions of Asia, Europe, North America etc. This is a very small niche when you compare to other niches like gaming, fitness and the more mainstream niches but I think it’s better to go sub niche and specific as possible for the best results. Now let’s take a step back for a moment and realise what we are really doing here as far as the audience. My SEO audience as an example was done in ONE day in between doing other tasks. We are then converting them info facebook audience and creating lookalike audiences. Then we are converting as many of this audience as we can into REAL email list subscribers. We are building an email list using a shortcut strategy. We are building a following, building familiarity, trust and authority at the same time. Pretty cool huh! Because we can take this even further but for now I will test this simple approach and see how we do and then tweak, test and as with all strategies there will be an evolution of ideas and progress. Want to follow along and see what happens? All you have to do is buy LeadKit Pro from my link and as a bonus I will add you to a member area (using LeadKit Pro) and you can watch me do each step from idea to traffic and list building. We will add you to the member area to follow the progress and you can learn what tools I am using and what is happening in real time with the project.